In the Hawaiian culture, the saying I walea ka manu i ka ‘ula o ka lehua translates to “The bird is attracted by the redness of the lehua” and hints at the intimate connection between tree and bird. The ‘ōhia lehua is a flowering tree in the myrtle family and is endemic to Hawai‘i. As an early colonizer after a new lava flow, it’s known as a foundational species of the Hawaiian forest and is considered critical to the function of Hawaiian watersheds and the ecology of Hawai‘i. ‘Ōhi‘a produce a dizzying display of flowers, made up of a myriad of stamens that range in color from fiery red to bright yellow. The trees can grow to 100 feet and can live for hundreds of years. Over millennia different species and varieties have evolved to adapt to the numerous different micro-climates found in Hawaii, from sea level to Kauai’s tallest peaks. ‘Ōhi‘a can grow as a stunted bush in bogs, on windswept hillsides, on lava flows, and as a giant tree in lush rainforest habitats. Unfortunately, a disease known as Rapid ‘Ōhi‘a Death (ROD) is killing the trees. First detected on Hawai‘i Island more than four years ago, it has since affected more than 135,000 acres of ‘ōhi‘a forest on the largest of Hawai‘i’s islands. Hundreds of thousands of trees have died. In Spring 2018, ROD was confirmed on Kaua‘i at Moloa‘a State Forest Reserve. By the end of the year, ROD had been detected in three additional locations on Kaua‘i at elevations ranging from 550 to 1,600 feet above seal level. These sites represent different forest types, including very disturbed and intact forests. This is devastating news. However, conservationists are responding. On Kauai, teams have conducted helicopter surveys using digital mobile sketch mapping followed by high-tech drone imagery and identified 21 areas on state and private lands with ʻōhiʻa trees showing symptoms consistent with the disease. By the end of 2018, a total of 20 trees had tested positive forROD. First responders are continuing their surveys and sampling of suspect trees. Scientists at the U.S.D.A. Agricultural Research Center in Hilo, Hawaii, have identified two different species of fungi that cause ROD, Ceratocystishuliohiaand Ceratocystis lukuohia. Both species are new to science. Unfortunately, both types of ROD have been detected on Kauai. “The pathogen enters the tree through a wound; be it a broken limb, twig or, perhaps, a scuffed up exposed root. 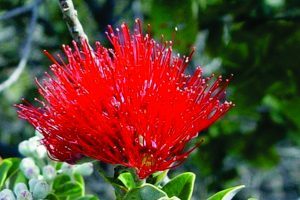 Whereas C. huliohia may take months to years to kill an ʻōhiʻatree, C. lukuohiacan kill a tree within weeks,” said James B. Friday, the extension forester with the University of Hawaii. Scientists have also determined the disease enters the tree through open wounds (made by humans through clippings, trimming, weed whacking, and stepping on tree roots; or other animals, such as rooting pigs; or broken branches and abrasion caused by strong winds/storms). Once the fungal spores enter the trees, the disease advances by cutting off the tree’s flow of water. Thus, one way to help slow or prevent the spread of ROD is to avoid wounding ‘ōhi‘a.